I made this page using material from the April Cocoa Daisy kit and bits and bobs from my stash. It is about myself, telling ME to appreciate my look, an that way fooling myself to feel better. It is quite amazing what a haircut and some nice clothes can make to your feelings about yourself. Material used: Patterned paper; Elle´s Studio (Lovely Stripes).Jillibean Soup (Peeled Cocumber, Yellow Tomtoes). Crate Paper (Growth Chart). 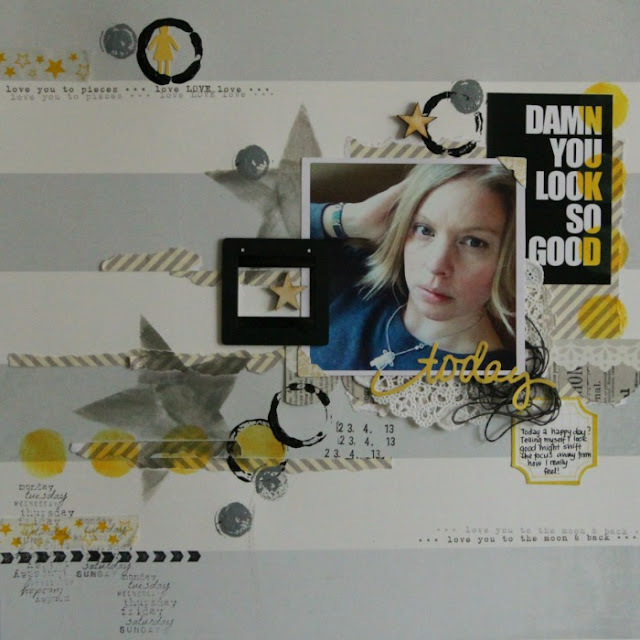 Embellisments: SODAlicious (tag, stars, week day stamp). Jillibean Soup Wise Words Stickers. Most other stuff leftover bits and bobs. Jættefin - roligt att se bild dig på layouter ! What a fabulous page!!! Thanks for playing along, great to see you again! This is amazing. Love the colour combo you've used here.